Just back from your last vacation? Dreaming about your next one? There’s no better time than now to start thinking about your next travel adventure, and no better time than now to start looking for the best airfare for that trip. A trip here might require a little extra planning! When searching for airfares, it’s important to remember that each seat on an airplane doesn’t sell for the same price, and that doesn’t simply mean first class vs. coach. Even if you’re sitting in coach, chances are that the person sitting next to you paid a very different price than you did — perhaps hundreds of dollars more or less. How? Let’s say that there are 100 coach seats on a plane. The airline divides them into “classes of service” — and, except for first class, are different only in the price paid for the ticket. Each of these classes is assigned a letter: F for first, Y for the most expensive coach ticket (fully refundable), and then a variety of letters (H, K, M, T, V, Q, etc.) for nonrefundable coach fares. Each coach class has its own price, and each has only a certain number of tickets available. It varies by airline and even by flight, but of those 100 coach seats, it’s possible that only 10 are in the cheapest class of service — and no, the classes aren’t linked to particular seat locations. Look at all of those coach fare classes … and notice that the cheap seats (K, W, etc.) are already sold out! So, that $99 one way airfare you heard about on the radio? It’s probably already sold out, even though 90 of the 100 seats on the plane may still be unsold. To complicate matters, the prices fluctuate at the airlines’ whims. Even the number of seats assigned to each class of service can fluctuate from day to day. While it’s easier to find a cheap airfare than to haggle over the price of a new car, it takes patience, some Internet savvy, and a little know-how. Of course, an alternative is a good travel agent, whose services can be well worth their nominal service fees. Developing a relationship with a good travel agent can really pay off over time. Airfares go on sale about 330 days before departure. At that point, they’re often as high as they’ll get, roller-coastering down and up for months until they steadily climb again closer to the date of departure (because the cheap seats are sold out and, well, because they can!). There’s a lot of debate among seasoned travelers about the best time to buy tickets. The proverbial “sweet spot” is nearly impossible to pin down, but a good rule of thumb is months, not weeks, in advance. We booked our flights to the USVI for our group of ten people eleven months in advance. Your flexibility and others’ demand also factor into the equation. Planning a spring break trip along with every other family in your one-airport town? Hoping to fly out on a Friday night and fly home the following Sunday? So is everybody else — and the airlines know it. The few cheap seats will sell out at least eight to ten months in advance, and, no, no matter what the nice agent tells you on the phone, they won’t be releasing any more. So, what’s a budget-conscious traveler to do? Here are a few tips to help pin down that ever-elusive cheap airfare. Our first stop is ITA’s Matrix Airfare Search. ITA develops web content for individual airlines and is kind enough to share its interface –and real-time airfare database– with the world. Good news: it’s free. Bad news: they don’t sell airline tickets. But, it’s a great place to get a sense of what the lowest possible airfares are for your upcoming trip. 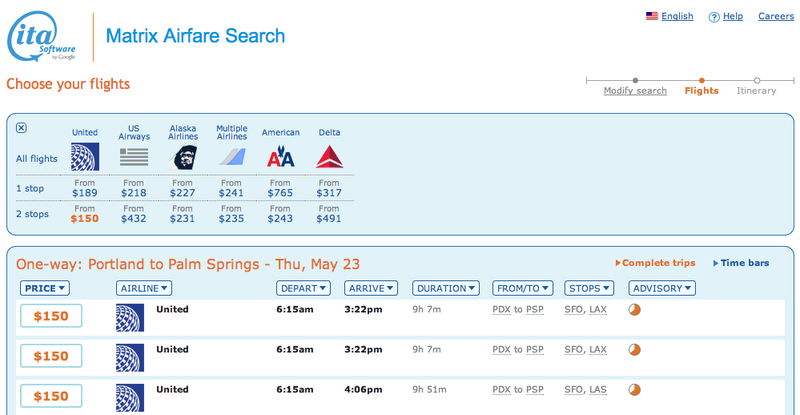 ITA’s website makes searching multiple airlines’ airfares easy. Once you’ve pinned down the airfare (or at least figured out which airline has the better fare and flight times for your trip), head to that airline’s website to do your final searching and booking. Booking online via an airline’s website generally avoids extra fees, but tricky routings or discrepancies in information are worth a call to the airline and perhaps that additional fee. Don’t care when in May you leave for your trip? 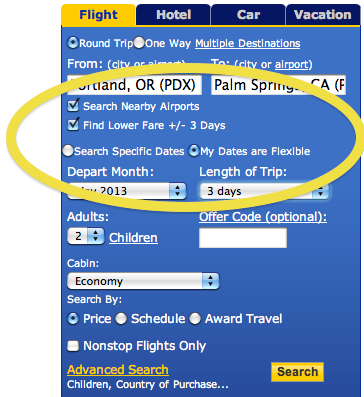 Use the flexible dates or calendar feature on airfare websites to see the days with the lowest available fares. Being flexible with your trip dates and even airport choices could save you money. In any case, you’re much more likely to get the customer service you’re expecting from airline agents if you bought your tickets directly from them. The last thing you want to hear at 3 a.m. after your flight out of O’Hare has been cancelled is a gate agent telling you that you’ll need to call crazycheapairfares.com to reroute your flight! Start monitoring fares as soon as you can, ideally 330 days out, to get a feel for what the highest fare is. Consider alternate airports. LA has five airports within an hour of each other. Can’t get into Chicago? Try Milwaukee. Explore open-jaws, one-way fares, and creative routings. 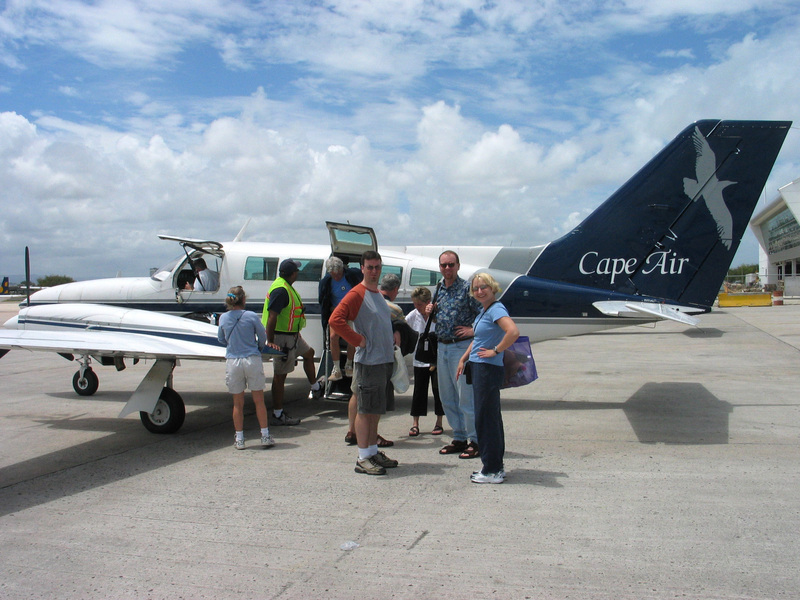 On a recent trip to the Caribbean, we flew into Miami, spent a few days visiting friends, and got a one-way rental car (no extra drop fee) to the Ft. Lauderdale airport, where we caught our flight to the islands. On the return trip, we did the reverse. By doing so, we flew to the Caribbean from FLL for much less than we would’ve from MIA and added a component to our trip that essentially paid for itself! Check into discount airlines. Not every airline publishes its fares on the third-party airline websites. Best example: Southwest. Buy sooner rather than later so you don’t wind up cancelling a potential trip because the super-low airfare you were holding out for never materialized. If your travel dates aren’t flexible, once you see a fare that you can afford, buy it and stop monitoring that fare. If your dates are flexible, give yourself a bit more wiggle room, but a great vacation with a little buyer’s remorse sure beats sitting at home regretting that you didn’t buy the tickets when you could have. Of course, we factor in convenience and arrival & departure times before we select a fare, sometimes forgoing the cheapest fare to avoid an overnight flight or losing a whole vacation day to travel. This extra spending is often balanced out by hotel or car rental savings. However you book your airline travel, be sure to request seat assignments as soon as you book your flight — otherwise you might wind up being involuntarily bumped off of an oversold flight. Whatever your top priority, the bottom line is to monitor airfares, get creative with airports, airlines, and routings, and buy when you can! What successes have you had with finding low airfares? Leave a comment and let us know! Enjoy your next air travel adventure, whether it’s for a week or a weekend!